Sean and I found this picture on a wall at a farmer’s market. This is what I look like in the Oxford rain, my umbrella turned inside-out like a black tulip above my head. As I walk the tulip fills with water. 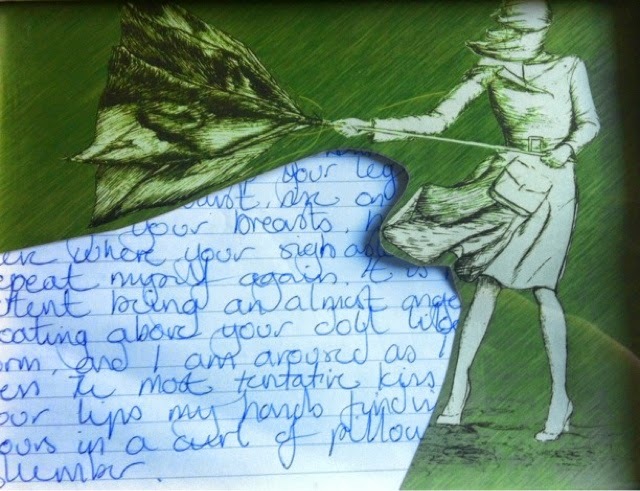 Beneath the umbrella is a love note that looks like a huge gust of wind. Since most of the note is hidden we can make an altered love-note from the parts that are showing. I come up with: “Your breasts sigh again, almost doll-like, as I kiss my pillows.” Anyone else want to have a go before the ink runs in the rain?